With various enhancements such as the Shimano Deore 27 speeding gear, the GT Aggresor XC2 can command optimum uphill speed while ensuring total control through its Suntour XCR 120mm travel fork, and power-brake capacity through its Tektro Auriga Comp hydraulic 180/160mm rotors. Other features of this GT mountain bike include front suspension, alloy rims, classic cage with toe clips pedals, quick release wheels, and SDG Bel Air saddle among others. For men who thrive in action, this is indeed a suitable mountain bike model that incorporates both dependability and style. In black and white lightweight aluminum frame, this bike also comes with important add-ons such as the GT Alloy headset. The GT Aggressor XC2 Mountain Bike has received generally positive reviews from its users. The features the have proven to be of most value to the users are the bike’s lightweight structure which allows for a smooth ride, easy gear shift, reactive disc brakes, and shock absorbent front forks that ensure absolute safety and wheel command. The specialized tyres have also been given special mention. Users have provided testimony on how dependable the tyres technology is which permits speed, ease of ascent, and even bump reduction. According to one review, The GT Aggressor XC 2 is truly a good investment that provide the exact worth of the money spent by the customer. With the many mountain bike models in the market, this particular brand has been rather consistent in creating only the best and ergonomically apt mountain bikes that never fail to rise up to the occasion. One less favorable review of the Aggressor XC 2 is with regards to its saddle. A user comments that the seat is too hard and uncomfortable. This minor disapproval notwithstanding, this model from the GT brand has truly met the expectations of its patrons. Men with all the drive and swagger has finally find their most reliable ally with the GT Aggressor XC2. With its incomparable design, this bike truly has the speed, strength, and power. 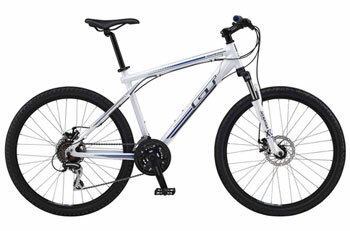 You can buy GT Aggressor 2012 new model cheap online through Evans Cycles here.